This is what I saw when I was driving down the road yesterday. Looks pretty comfortable. At least that guy pretty obviously doesn’t believe the myth that driving barefoot is illegal. The barefoot driving myth is one of the ways I got started with barefooting, way back in the mid-1990s. Back then the internet was mainly things like email and Usenet newsgroups, and the driving myth would show up fairly regularly. Also, back then, state statutes weren’t online, so when I went to debunk that myth, I went to the library and found the AAA Digest of Motor Vehicle Laws. (Of course, back then, there was no internet link and you had to look at the real book.) It listed it as legal everywhere in the United States. I checked copies from 1988 through 1994 and they all said the same thing. Oddly enough, the entry for Ohio said it was “not recommended.” Now, state legislatures do not pass “not recommendeds”, they pass laws. I’m guessing that the AAA person called the Ohio BMV, and the person on the phone, instead of actually answering the question, said, “Well, we don’t recommend it.” Of course, that has no legal import. That was also on the Ohio website until fairly recently (5 years ago or so). Just because someone got a ticket for driving barefoot doesn’t mean that it is illegal. I was cited for driving barefoot several years ago. The thing that upset me was that the judge allowed the police officer almost an hour to look through the law book before he dismissed the case. (The judge postponed my case to the end of the day’s proceedings.) The officer never did find the law he was looking for. And all this despite the fact you can see people driving barefoot in films from back when people did still go barefoot all the time. However, it is definitely unsafe driving to have your leg up there, no question about that. You have three pedals a wheel and a handbreak, This person has one foot on the accelerator, and one hand on the wheel. Even with cruse control, that really is not safe, and that has nothing to do with what is on their hands or feet, just where they are. I know for a fact you would get ticketed for having your leg up there in England. No, it’s not unsafe. I do it myself sometimes. We have 2 pedals, and generally use the right foot to both accelerate and brake. The left foot does nothing. I know that’s different than in the UK, where the window foot is used for the accelerator. It is unsafe because in the unlikely event of an accident, the seatbelt and airbag can only save your life if you are in a more or less “standard” seating position. Barefoot or shod is irrelevant to safety but if your limbs are all over the place, both your ability to react in case of a sudden danger and your chances to survival if a collision does occur are significantly reduced. Cars today are designed with a great number of safety systems – designed with a regularly seated and belted passenger in mind. that comes out or what it would do. 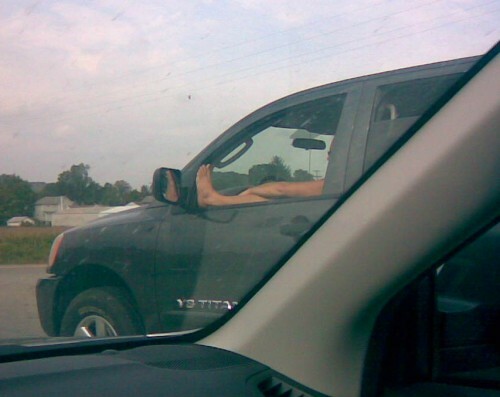 I do know I worry when I see passengers with both feet up on the dash. If that airbag goes off, they’re getting a knee in the chin. But for the driver with the leg on the side there, it may be OK. Sometimes when I am driving barefoot, I tend to cross my leg and place my left foot next to my right knee. I still drive normally when doing this and I learned to change the radio buttons with my left toe as well as raise and lower the volume. I haven’t done this in quite a while though. Normally when I drive barefoot, I just use my big right toe press the gas and brake pedal. In Australia you’d get pinged for having a body part out of the car. Ridiculous I know but even having your elbow out is technically illegal.